Attestation or legalization of certificates/documents is a key factor, whether you are looking to obtain a job, wish for higher studies or want to start a business in Kuwait. The procedure for attestation for Kuwait needs attestation of Certificates from the State Norka Centre/Ministry of External Affairs in India. 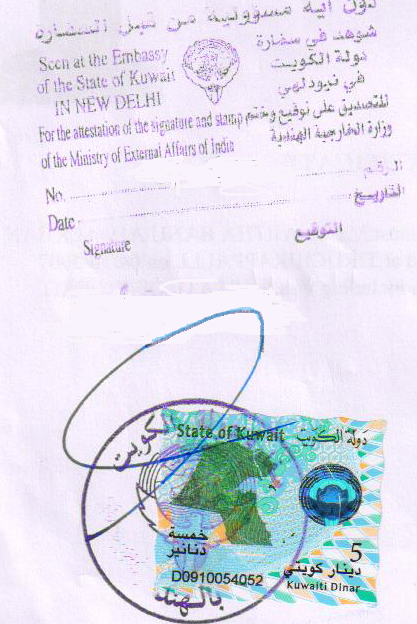 The Government of Kuwait thus requires all educational/Personal certificates, professional or academic certificates issued from India to be attested by the kuwait Embassy/consulate in India and further attestation by the Ministry of Foreign Affairs of Kuwait Government before one gets a valid Visa. Don't worry; we atArabian Attestation and Travels have got years of expertise in providing attestation services for all types of customers and clients. With a huge client base and dynamic team of professional we will resolve all your attestation needs. The Kuwait Attestation undergoes in a choice of locations in India including, Chennai, Bangalore, Mumbai, Delhi, Hyderabad, Lucknow, Jaipur, Bhopal and Kerala. Just give us a call or drop us a mail and our team of professionals will help you out with the attestation service.